This beautiful and practical sterling bangle bracelet is made for those who have problems getting a closed bangle to fit over their hand or just like convenience. 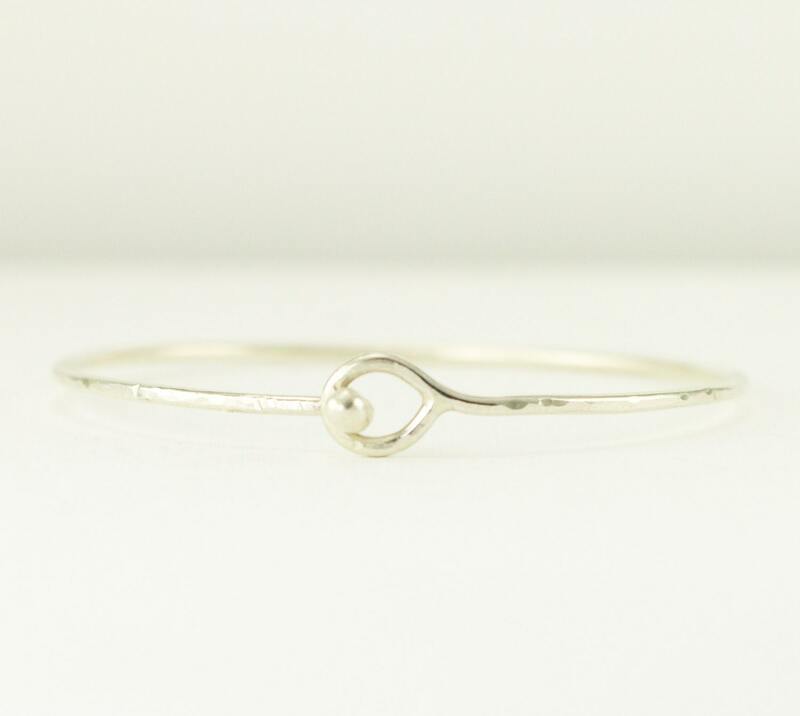 A minimalist easy open hammered latching bangle, this bracelet can be modified to fit various jump ring openings for those who want an "add a charm" bangle. Bangle is made from heavy gauge sterling silver 2 mm round wire, cold forged by hand, leaving lovely hammer facets to catch the light when it moves. I can make the ball any size to allow charms on soldered jump rings to slide over the ball onto the bangle (see last photo as an example of one celebrating weight loss goals). This bracelet can definitely be worn alone or layered with other light weight bangles for a contemporary look. . If you like, I can oxidize at no additional charge ( shown in second photo). I consider this bangle to be medium weight and very sturdy. This listing is for the sterling bracelet only, no charms. I do not make this in gold filled or plated materials for this bracelet. Please note: if you plan to open the bracelet to wear, most people wear more of a bracelet size than a bangle which slides over your hand. Measure your wrist with a soft measuring tape, then add 1 - 1 1/2 inches to allow you to close it easily. If you plan to not open this bracelet and slid it over your hand - do order as if you were buying a solid bangle - see last photo for measuring. Small- 7.5 inch circumference, about 2.25 in diameter. This size will comfortably fit a 5.75-6.25 inch wrist. Medium- 2.5 inch diameter, 8 inch bangle will fit a larger wrist. For a Large or XL size 2.75 or 3 inch diameter I recommend a heavier bracelet 2.6mm thickness to help the bracelet maintain it's shape. Please contact me for a quote and reserve listing. In the fourth photo I show this bracelet created in 14k rose gold. You may request a reserve custom listing in solid 14k yellow, rose or white gold in a slightly lighter weight material because gold is very springy and hard it will still hold it's shape very well..
All bangles are available as Oval or Round. Any special custom requests for this bangle will be priced on an individual basis, please contact me to discuss your ideas and to get a quote before ordering. This listing is for the plain bangle shown in the main photo. Please allow 3-5 business days before shipping. Please measure accurately using a soft tape measure around your wrist. I usually add 1.5-2 inches to that measurement depending on how you like to wear your bracelets if you are opening the bracelet. Your bracelet will ship in a box suitable for gift giving. I will include a drawstring pouch for storage. Thanks for stopping to browse. Great experience , really nice bracket , love it ! !